Mention the word ” quillet” to estate agents up and down the Welsh Marches and they will know what you mean, although not many other people do. It crops up now and again in property sales, especially farm sales where there is a piece of land included in the sale that’s not necessarily joined to the main estate. Delve into the etymology, and you’ll discover that it comes from medieval, legal French, which was used in England in the Middle Ages and helps explain its continuing use nowadays. 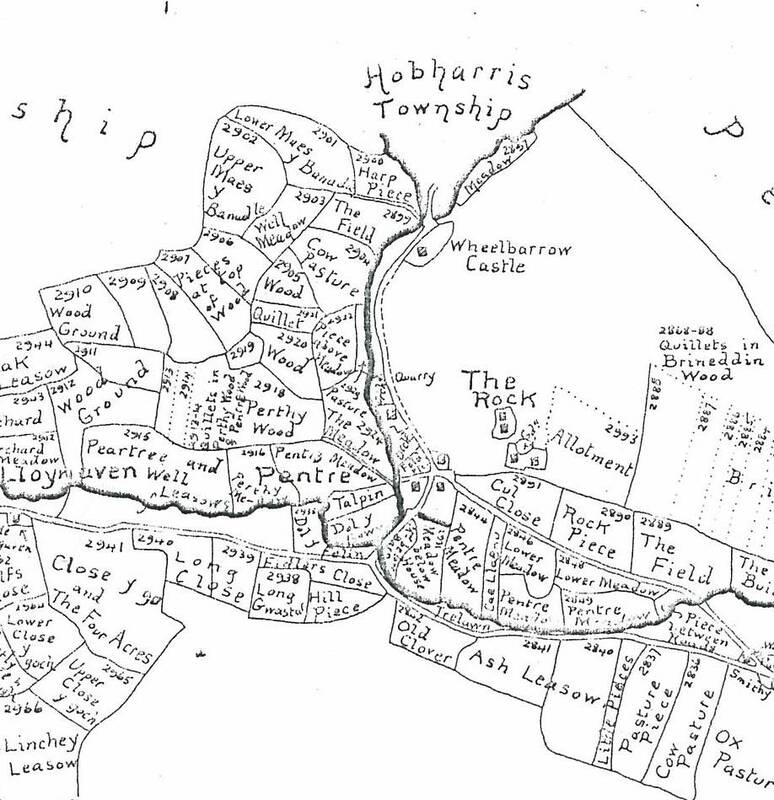 Quillets marked on 1847 Tithe Map of Hobendred (Chapel Lawn) – click to enlarge. Quillet – a word from the French “cueillotte”, a collection. Its origins lie in medieval French legal terminology but the use passed into English and Welsh law to describe a small parcel of land, often separate from the main holding. The word “quillet” was commonly used in North and Mid Wales in the Middle Ages in the context of land ownership, and although not necessarily applicable to woodland, it often was. Its use is not uncommon on the English side of the border with Wales , probably because politically and culturally some places now in England were in Wales at various times, and others were Welsh influenced, so the word could have drifted eastwards as land changed hands. In Cornwall, where the word is also not uncommon, the spelling ‘quillett’ and ‘quillet’ are both used, while in Somerset we find ‘guillet’. There is no entry in the OED for “quillet”, but the English Dialect Dictionary (most recently published 1905), provides a lengthy description which, in summary, states that quillets are narrow strips of land the length of a standard furrow marked off from similar strips lying in the same field by mere stones. 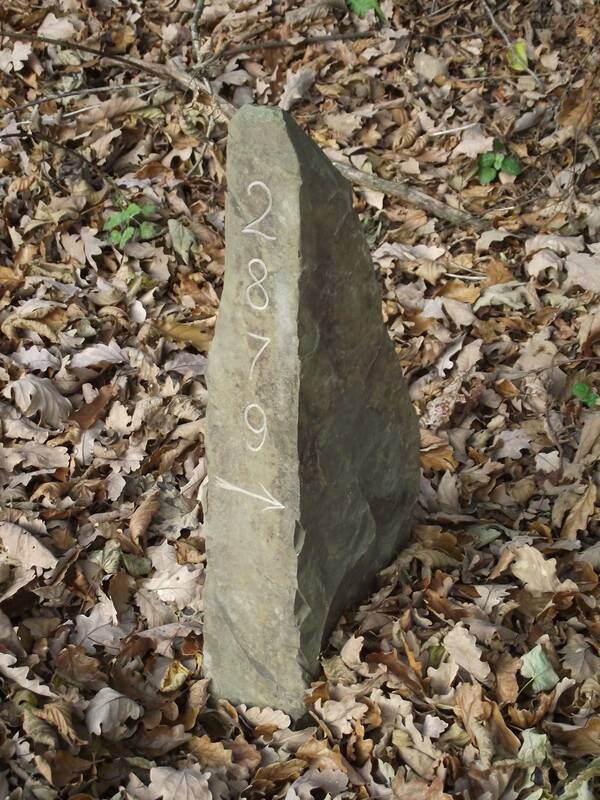 It goes on to describe mere stones as at the corners of unmarked plots of land within larger areas of land to show where one man’s portion ends and another’s begins. This description matches the strips in Brineddin Wood very well. The EDD quotes various examples from around Britain. The Merriam Webster Dictionary has “Quillet- a small tract of land, chiefly dialect, origin unknown”. An entry in Folk Etymology which can be found by searching in Google Books, describes Quillet as “an old word for a croft or small parcel of land, or a detached portion of one county located in another”. Examples exists in Derbyshire, Leicestershire, Suffolk and Essex relating to a detached portion of one county in another. In Cornwall, a quillet is sometimes used to apply to systems of very small fields that have been created where land has been sub-divided as the result of inheritance. Regarding its etymology, there are various theories. One is that that it is a legal term deriving from the Latin ‘Quid Libet” – “Do what you will”, suggesting a piece of land that is of no great importance. A slightly more prosaic theory is that the ‘et’ is a diminutive of quill, being something thin. The quillets in Brineddin Wood are certainly thin, although not all quillets are. The most convincing suggestion, also found in Folk Etymology, is that it is from the French, “cueillotte” (from “cuellir” to gather), ‘a collection’ or ‘a small piece gathered out from a larger’. Originally used in France in the context of harvesting, further searches on the internet find that the term has passed into legal terminology in the contexts of French marine law (shared cargos) and administrative divisions (“Tchuillets”) in Jersey). In summary, it seems likely that the French legal term “cueillotte” was coined during the Middle ages and adopted for a number of contexts in both France and in England. English language and law were dominated by French influence, and the term was employed in the context of land ownership, particularly for small plots of land separate from a main holding. Whether it was more widespread in Cornwall, Wales and The Marches than the rest of England, and if so, why, is unclear. The entry in the EDD may also prove helpful in unravelling the history of the Brineddin quillets as it explains that the term was often used where a piece of reclaimed or enclosed land was divided up between the freeholders. We know that most if not all the freehold properties in Chapel Lawn had a quillet attached to them at one time. What we don’t yet know is who divided them up in the first place and when this took place, although the existing twenty quillets were certainly in existence before the Spoad Inclosures of the 1840s and 1850s. There is also an indenture dating from 1637 held at Shropshire Archives describing such a process of division in the eastern portion of the wood (then known as Gwellinharat – probably meaning Angharad’s bed or plot), ironically long since ‘unquilleted’, although the word quillet is not actually used in this document. The lower ends of the quillets were originally separated by stones. An old and probably apocryphal tale persists that many years ago quillet owners would sneak out in the dead of night and move stones one way or the other to increase the size of their quillets. 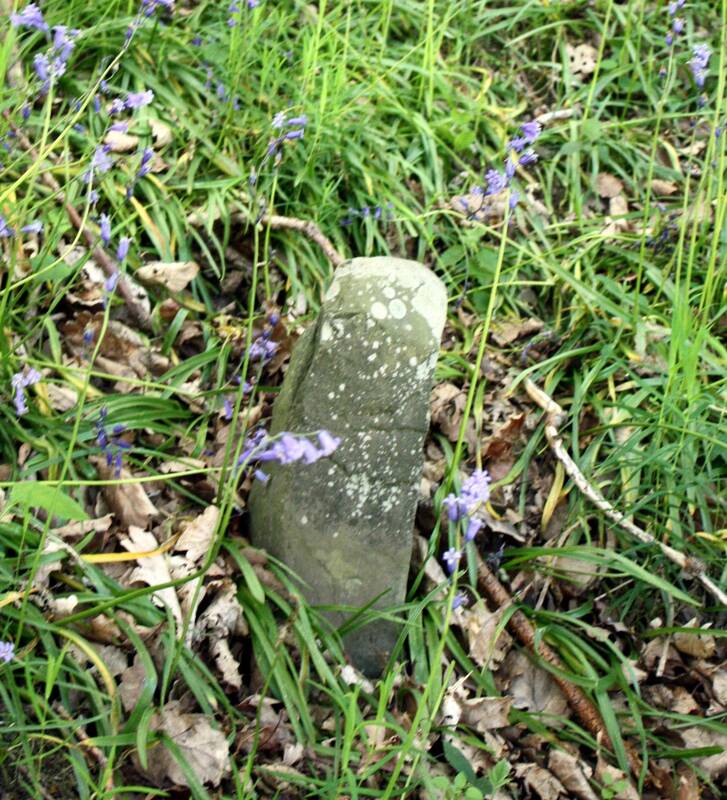 Only one old stone remains towards the eastern end of the wood, but we have resurrected the practice by installing a brand new one at the bottom left hand corner of quillet 2879. Maybe other owners will follow suit.